The joint works properly when the lower jaw (mandible) and its joint (both the right and left) are synchronized during movement. Temporomandibular Disorder (TMD) may occur when the jaw twists during opening, closing or side-motion movements. These movements affect the jaw joint and the muscles that control chewing. Most people will experience relief with minor treatment. More severe cases may be treated with physical therapy, ice and hot packs, posture training and orthopedic appliance therapy (splint). Eating soft foods and avoiding chewing gum also will help relax the muscles. The condition is often cyclical and may reoccur during times of stress, good or bad. As the patient, you should be active in your treatment after seeing a dentist for a diagnosis regime by being aware of the causes of your jaw problems. Make routine dental appointments, so your doctor can check TMD on a regular basis. Giblisco, Joseph A. DDS, Charles McNeill, DDS, Harold T. Perry, DDS. 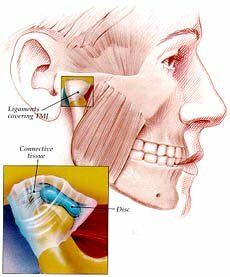 Orofacial Pain; Understanding Temporomandibular (TMJ) Disorders. Quintessence Publishing Co., Inc., Carol Stream, Illinois. 1994. E. Mac Edington, DDS, MAGD, ABGD. NIDR, Temporomandibular Disorders, Bethesda, Maryland. Wilkinson, Tom, "New patterns of dental disease; Management of temporomandibular disorders." Australian Dental Association News Bulletin, No. 246, July 1997.